I’ve been making this classic Chinese dish for years – sometimes using prawns instead of chicken, or a veggie version with just tofu and mushrooms – and it’s always delicious. Place the mushrooms in a small bowl. Pour over just enough boiling water to cover and soak for half an hour. Drain, reserving the soaking liquid, and slice thinly. Cut the chicken into bite-size pieces. Whisk two tablespoons of soy sauce, sesame oil and cornstarch to make a marinade. Pour it over the chicken, stir to coat and set aside for half an hour. 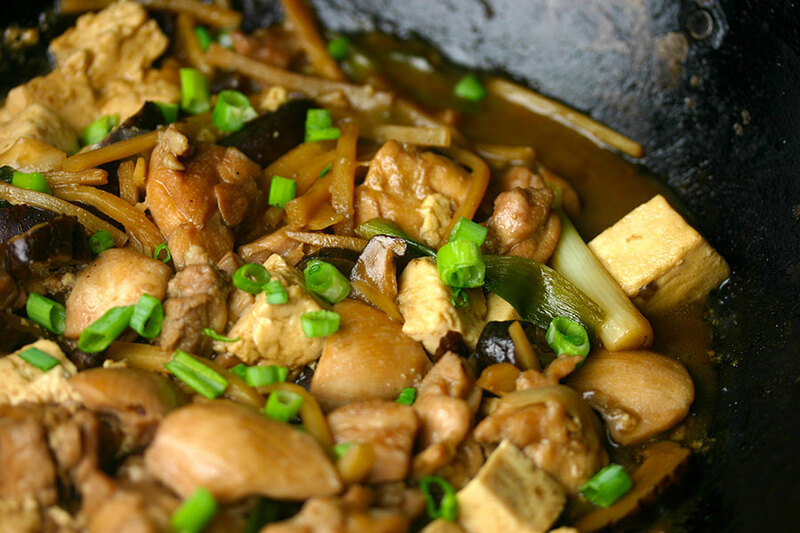 Heat the sunflower oil in a wok or heavy pot over medium heat. Stirfry the chicken and ginger for a few minutes, or until the meat is no longer pink. Add the mushrooms and bamboo shoots and cook a couple of minutes more. Add the mushroom soaking liquid, rice wine, remaining two tablespoons of soy sauce, and sugar. Stir to combine, bring to the boil, then lower the heat to a simmer. After ten minutes, carefully stir in the tofu and the green onions. Cook for another ten minutes. By this point the sauce should have thickened somewhat. If you want it to be thicker, whisk an additional two teaspoons of cornstarch with a tablespoon of cold water and add to the dish, stirring until the sauce thickens.